After seeing Dario Franchitti win Indy yesterday, I felt inspired. Inspired to call myself Dario FrankEatty if I ever compete in the Nathan's Hot Dog Eating Competition at Coney Island on July 4th, that is. 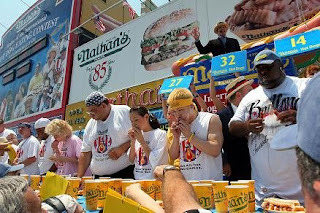 The pregame introductions at the Nathan's Hot Dog Eating Contest are the best introductions in sports- whimsical, entertaining, and mildly educational. The antithesis of this is the introductions at professional soccer matches, especially in Europe, where the players walk out holding hands with children, then exchange flags, and a bunch of other pomp and circumstance that reminds me of the introductions on Iron Chef. 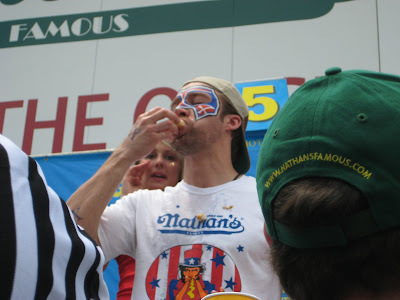 Soccer just needs to abandon all that foolywang, but I think the hot dog eating competition intros would be even funnier if they came holding holding hands with random Coney Island kids during the introductions as seen below.